/ˈkɛəri/) is a large town and suburb of Raleigh, North Carolina in Wake and Chatham counties in the U.S. state of North Carolina. Located almost entirely in Wake County, it is the second largest municipality in that county and the third largest municipality in The Triangle after Raleigh and Durham. The town's population was 94,536 at the 2000 census, but the Census Bureau reported that its population had grown to 135,234 by 2010 (an increase of 43.1%), making it the largest town and seventh largest municipality statewide. According to the US Census Bureau, Cary was the 5th fastest growing municipality in the United States between September 1, 2006, and September 1, 2007. Raleigh, Durham, and Chapel Hill make up the three primary cities of the Research Triangle metropolitan region even though today Cary is the 3rd largest city in the metropolitan area. The regional nickname of "The Triangle" originated after the 1959 creation of the Research Triangle Park, primarily located in Durham County, four miles from downtown Durham. RTP is bordered on three sides by the city of Durham and is roughly midway between the cities of Raleigh and Chapel Hill, and three major research universities of NC State University, Duke University, and UNC-Chapel Hill. Located in the Piedmont region of the eastern United States, Cary is near North Carolina's Research Triangle. It is edged on the north and east by Raleigh, on the north and west by Research Triangle Park and Morrisville, on the south by Apex and Holly Springs, and on the west by the Jordan Lake area. The topography of the town is hilly. Cary is in the Humid Subtropical climate zone. It receives hot summers and mildly cold winters, with an average of 7 inches of snow a year. Temperature extremes here range from the negatives to over 100 degrees Fahrenheit. Hurricanes and Tropical Storms affect Cary, usually after weakening substantially from being over land. Some, such as Hurricane Fran in 1996, can still cause great damage in the area. Nearly all of Cary is in western Wake County, with neighborhood-sized sections in the northeast corner of Chatham County. According to the United States Census Bureau, the town has a total area of 43.5 square miles (112.6 km²). 42.1 square miles (109.0 km²) of it is land and 1.4 square miles (3.6 km²) of it (3.17%) is water. More recent Cary records show that as of 2007 the town has a total area of 52.79 mi². Page-Walker Hotel (now local history museum). Allison Francis "Frank" Page is credited with founding the town. Page was a Wake County farmer and lumberman. He and his wife, Catherine "Kate" Raboteau Page bought 300 acres (1.2 km2) surrounding the railroad junction in 1854 and named his development Cary, after Samuel Fenton Cary (a former Ohio congressman and prohibitionist he admired). Page became a railroad agent and a town developer. He laid out the first streets in Cary and built a sawmill, a general store and a post office (Page became the first Postmaster). 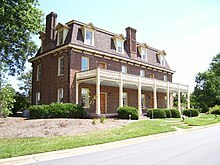 In 1868, Page built a hotel to serve railroad passengers coming through Cary. Cary was incorporated on April 6, 1871, with Page becoming the first mayor. In 1879, the Raleigh and Augusta Air-Line Railroad (later the Seaboard, now CSX Transportation) arrived in Cary from the southwest, creating Fetner Junction just north of downtown and spurring further growth. In the early years Cary adopted zoning and other ordinances on an ad-hoc basis to control growth and give the town structure. Beginning in 1971, the town created Planned Unit Development (PUD) zoning to accommodate population growth related to the growth of Research Triangle Park nearby. A PUD allows a developer to plan an entire community before beginning development, thus allowing future residents to be aware of where churches, schools, commercial and industrial areas will be located well before such use begins. Kildaire Farms, a 967-acre (3.9 km2) Planned Unit Development in Cary, was North Carolina's first PUD. It was developed on the Pine State Dairy Farm by Thomas F. Adams, Jr. Adams named a section of Kildaire Farms "Farmington Woods" in their honor. The local government has placed a high value on creating an aesthetically pleasing town. According to the 2010 Census, there were 135,234 people and 55,303 households in the city. The racial makeup of Cary was 73.1% White, 8.0% African American, 0.4% Native American, 13.1% Asian, 0.0% Pacific Islander, and 2.6% were from two or more races. People of Hispanics or Latino origin made up 7.7% of the population. In terms of higher education, 68.0% of adult residents in Cary (ages 25 and older) hold an associate degree or higher, and 60.7% of adults possess a baccalaureate degree or higher. Cary has one of the lowest crime rates in the state for municipalities of its size. The home ownership rate (owner-occupied housing units to total units) is 72.8%. In 2001, the town of Cary was declared the fourth safest of 327 large municipalities in the nation in the 8th Annual Morgan Quitno Safest (And Most Dangerous) City Award. Cary's reputation as a bedroom community for affluent transplants from outside the South has led to humorous backronyms for its name such as "Concentrated Area of Relocated Yankees." Data from the 2000 Census shows 29.2% of Cary residents are native to North Carolina. 55.2% were born in other states. Additionally, 15.6% of the town's population were born outside the United States. Cary has a council-manager government; the mayor and council members serve a four year term, with half of the council seats being up for election each odd-numbered year. Four of the six council seats are elected by district; the remaining two seats are at-large representatives. The current town council consists of Mayor Harold Weinbrecht and Representatives Jennifer Robinson (District A), Don Frantz (District B), Jack W. Smith (District C), Gale Adcock (District D), Erv Portman (at-large), and Julie Aberg Robison (at-large). On October 9, 2007, Harold Weinbrecht defeated then-mayor Ernie McAlister in the Cary, North Carolina, mayoral election of 2007. Citizen concern over the effect rapid growth was having on the town, especially on roads, schools, and the environment, led to McAlister's ouster. Cotton Incorporated - Industry trade-group. Deere & Company - Lawn care and turf products Manufacturing. Research In Motion - Makers of Blackberry smartphones. Deutsche Bank Global Technologies - Support operations for Deutsche Bank AG. Cary public schools were established in the late 19th century and are now part of the Wake County Public School System, the largest public school system in North Carolina. Public transit within the town is provided by C-Tran, with six fixed-routes. There is also a door-to-door service for the elderly (55+) and riders with disabilities. Triangle Transit operates fixed-route buses that serve the metropolitan region and connect to the local municipal transit systems in Raleigh, Durham and Chapel Hill. The League of American Bicyclists has designated Cary one of the fourteen recipients of the first Bicycle-Friendly Community awards for "providing safe accommodation and facilities for bicyclists and encouraging residents to bike for transportation and recreation". The Maine-to-Florida U.S. Bicycle Route #1 passes through suburban Cary, as does N.C. Bicycle Route #2, the "Mountains to Sea" route. The Raleigh-Durham International Airport, located north of Cary via Interstate-40 between Cary, Raleigh and Durham, serves Cary and the greater Research Triangle metropolitan region. Raleigh-Durham offers more than 35 destinations, serving approximately 9 million passengers per year. WakeMed Soccer Park, where the Carolina RailHawks play. ^ "Subcounty population estimates: North Carolina 2000-2009" (CSV). United States Census Bureau, Population Division. 2010-06-22. http://www.census.gov/popest/cities/files/SUB-EST2009_37.csv. Retrieved 2010-09-30. ^ a b "About Cary". Cary, North Carolina. http://www.townofcary.org/New_to_Cary_/About_Cary_272.htm. Retrieved 2010-05-23. ^ "Town of Cary Municipal Limits within Chatam County". Chatham County Planning Department. http://www.co.chatham.nc.us/dept/planning/planning_dept/Joint_Planning/Cary/misc/Cary_11x17.pdf. ^ "Looking Back". Cary, North Carolina. http://www.townofcary.org/New_to_Cary_/About_Cary_272/Looking_Back.htm. Retrieved 2010-05-23. ^ Bourne, Joel. "Suburbia Unbound". National Geographic. http://www.nationalgeographic.com/ngm/0106/feature7/index.html. Retrieved 2007-04-16. ^ "Cary Superlatives". US Census Bureau. http://www.townofcary.org/New_to_Cary_/About_Cary_272/superlatives.htm. Retrieved 2010-05-23. ^ "America's most unusual planned communities". CNN Money. http://realestate.yahoo.com/promo/americas-most-unusual-planned-communities. Retrieved 2010-07-28. ^ "Money Magazine Article - Part 2". Cary Chamber of Commerce. http://www.carychamber.com/money2.html. Retrieved 2010-05-23. ^ Carlson, Kelcey (2007-10-09). "Town of CaryWeinbrecht Wins Upset in Cary Mayoral Race". WRAL News (Capitol Broadcasting Company). http://www.wral.com/news/local/politics/story/1908306/. Retrieved 2010-05-23. ^ Stevens, Jacqueline (2009-12-16). "America's Secret ICE Castles". The Nation (Katrina vanden Heuvel). http://www.thenation.com/article/americas-secret-ice-castles. Retrieved 2010-07-20. ^ Cary History: Frank Page, CaryCitizen, April 22, 2010. ^ Weather Channel. "Cary, NC Weather". Weather Channel. http://www.weather.com/outlook/health/fitness/wxclimatology/monthly/graph/USNC0107. Retrieved 2010-04-05. ^ a b "Greenways". Cary, North Carolina. http://townofcary.org/Departments/Parks__Recreation___Cultural_Resources/Parks_and_Greenways/Greenways.htm. Retrieved 2010-05-23. ^ "All About Lazy Daze". Cary Citizen. http://www.carycitizen.com/2010/08/17/all-about-lazy-daze/. ^ "Best Places to Live". CNN. http://money.cnn.com/magazines/moneymag/bplive/2006/snapshots/PL3710740.html. Retrieved 2010-05-23. ^ "USAB National Training Complex". USA Baseball. 2010-03-22. http://web.usabaseball.com/news/article.jsp?ymd=20080618&content_id=33892&vkey=news_usab. Retrieved 2010-08-14. This page uses content from the English language Wikipedia. The original content was at Cary, North Carolina. The list of authors can be seen in the page history. As with this Familypedia wiki, the content of Wikipedia is available under the Creative Commons License.